Home > Phone Transfer > How to Transfer Contacts from Samsung to Sony Xperia Z3/Z5/XZ? Have you just bought a new Sony Xperia phone such as Z5? Probably you will need to transfer contacts from the old phone to the new Sony Xperia. We’re here to help you get started in transferring contacts from Samsung to Sony Xperia. By following the 2 methods below, you can also transfer other contents such as SMS, photos, videos, music, calendar and much more from any smartphone to Sony Xperia Z3/Z5/XZ/XA/M4/M5 simply. 1. Download Xperia Transfer Mobile from Google Play and then install the app on both Samsung and Xperia phone. Afterwards, please install and launch it on the two devices. 2. On Sony phone, please check Android as the other device type and set it as the receiving device; Meanwhile, set Samsung phone as the sending device. 3. Select the same connection method “Wireless” on the two smartphones. 4. Now pair the two devices. A pin code will appear on Sony phone, please enter the code on Samsung phone to connect the two mobile phones. Then please tap “Accept” on Sony phone to allow the invitation to connect. 5. It’s ready to transfer contacts from Samsung to Sony Xperia now. On Sony phone screen, please choose the local contacts and other contents that you need to get from Samsung, then tap “Transfer” button on bottom to move all local contact list from Samsung to your Sony Xperia smartphone. The transferring process will take a while, please wait until it was completed. Now all the contact information should have already been successfully copied with no content loss. Step 1. Please start Gihosoft Mobile Transfer and tap “Phone to Phone”, then connect Sony Xperia and Samsung phone to computer via USB cables. Step 2. Once the two phones have been successfully connected to computer, select “Contacts” and other files you need to transfer from Samsung to Sony Xperia. Step 3. Click “Start Copy” button to begin the contacts transferring process. After a while, a message will pop up when it has finished transferring contacts from Samsung to the Sony Xperia phone. Now you can open your Sony Xperia phone to check the contact list. 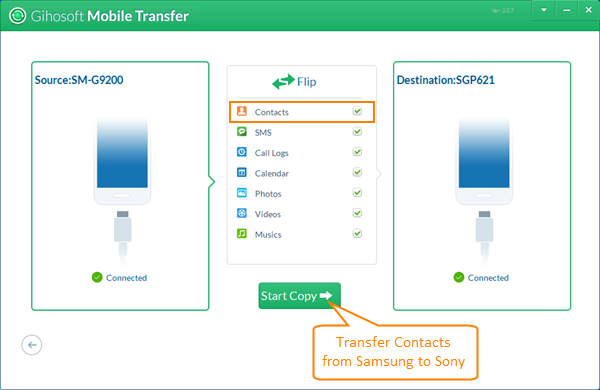 Apart from transferring contacts from Samsung to Sony Xperia, you can use Gihosoft Mobile Transfer software to transfer contacts between all Android devices.